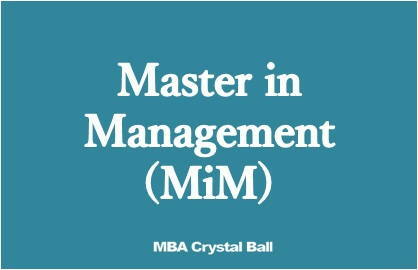 Masters in Management, or MiM, is a rising star among business MS degrees. Being of European origin, it has done well in the recent past in catching on in the rest of world, even the North American university market, usually dominated by the flashier MBA. The degree serves as a foundation basis for business education, covering the theory of the essentials and even specialisations – marketing, consulting, finance, and more. It is less demanding on work experience requirements and the good programs are a neat way to break into entry-level management jobs with a bang. For more information, here’s the sign post leading into MiM territory: Masters in Management – eligibility, duration, syllabus, career and salary prospects, as well as advantages and testimonials from students we have helped in cracking the MiM admissions battle. As with any other international education, MiM too is an education investment. Though not as expensive as the MBA degree, it does demand at least one year of your post baccalaureate time, in a full-time degree capacity. The resulting Master’s degree is well recognized and employability is fruitful, as has been discussed in the parent article linked above. However, it always pays to have the backing of a recognized business school with a reputed Masters in Management (and its aliases – MSc in Management, etc.) to increase its bankability. As is true for MBA too, many independent agencies have applied their schemes and methodologies to rank various flavours of Masters in Management, on a global scale. For the present article, we have relied on two credible sources for MiM ratings – the Financial Times’ MiM Rankings and QS World University Rankings in MiM. The schools listed below, per region, is a representation of MiM programs that have performed well in the past and present. Do bear in mind not to get carried away solely by the rankings (Read Are MBA rankings losing their credibility?). It is always a good idea to perform your own research and do your necessary bit by checking out the faculty members, resources, location, degree marketability and of course the wisdom gained from networking directly with current and alumni students. So, let us explore what are the popular Masters in Management degrees in various regions of the world – Europe, Canada, USA, Germany, Australia, UK and India. $27,000 plus preparatory fees No work exp. mentioned. $35,000 No to up to 2 years max. $42,000 Not eligible for more than 2 years of work exp. 1 year of full-time post undergrad work exp. needed for applicants with 3 year Bachelor’s degrees. $47,000 4 years Bachelor’s plus at least 1 year of MBA (accredited) equivalency so applicants are well prepared. Enquire for international student fees No work experience requirement mentioned. $37,000 No work experience requirement mentioned. $31,000 3 or more months of professional experience required. At least 90 undergrad credits in Business Admin. -MSc in Management and Technology Both for 24 months. Over $26,000 No work experience requirement mentioned. $44,000 No work experience requirement mentioned. *PGP program leads to an equivalent of Master’s in Business Administration. However, there is no work experience required and is open to fresh undergraduates in any field. Besides the above, there are MiM programs with about 30 worldwide business schools collaborating to jointly float the MiM CEMS degree – University of Dublin Smurfit, University of Mannheim, Queen’s Smith School of Business and more. As can be imagined, this is but a glimpse at the popular MiM degrees in the mentioned locations. A bit of perseverance can un-tap the possibilities that many more business schools and their Management Masters can offer. The idea is to research well and find your best fit. Though we do hope that these lists get the ball rolling in the favour of your Masters in Management application endeavour. – List of MiM Scholarships. Meanwhile, try these links for expanding your knowledge repertoire. MBA vs Masters in Management – Which is better?